NIAGARA FALLS — While most of us complain about the cold, we also have a place we call home, where we can snuggle up by the fireplace with a hot beverage and keep winter a bay. But there are many in the community who don’t have that luxury. 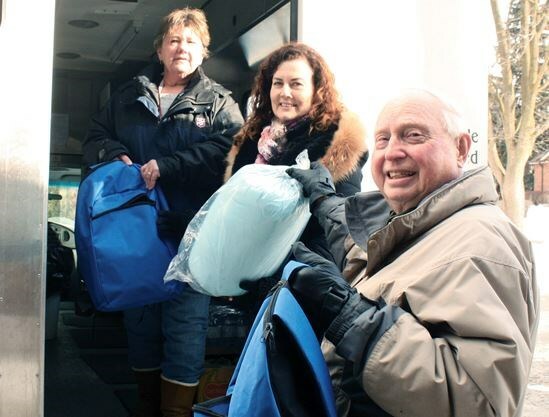 The Rotary Club of Niagara Falls is doing its part to help, and late last week, the service club donated eight winter survival packs to the Salvation Army to hand out to those in need as its outreach truck winds its way through the city, providing warm drinks and meals to those in need. “We’re glad to do it and provide a little bit of help,” said Rotarian June Mergl. Rotary Club of Niagara FallsThe survival packs, which contained such things as a sleeping bag, hat, scarf, gloves, water bottle and personal items, were obtained by the Rotary Club from Engage and Change, a Toronto organization that distributes survival packs in that city. The service club provided similar assistance in the summer months, donating hot weather survival packs which included such things and bottled water, hats and personal care items that were distributed through the Soup Kitchen (Niagara Falls Community Outreach). “A good 1,200 organizations applied for the packs,” Mergl said. In addition to the Salvation Army, survival packs were also donated to outreach programs at Southminster United and St. Andrew’s United churches and a fellow Rotarian who has forged a connection with people in need on Bridge Street. Salvation Army outreach worker Karen Johnson said on a regular trip through the city, the organization will see anywhere between 75 and 105 people. She said when the outreach efforts result in someone needing help finding shelter, arrangements are made.